I can't believe an entire school year has gone by since we started this blog! We started Under the Big Top camp today and I will blog a couple fun ideas from this week, but after that, I am off with my own kids for the summer. I am going to post a little over the summer as I am planning for next year, but not as often as during the school year. I'll use this "down time" to pass along cool things I find for teachers and parents. 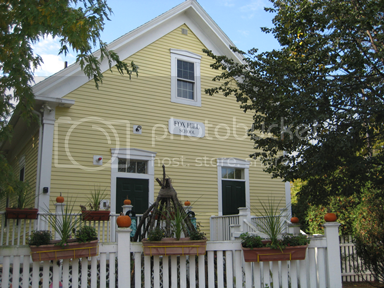 Here is my first find: Artkive! 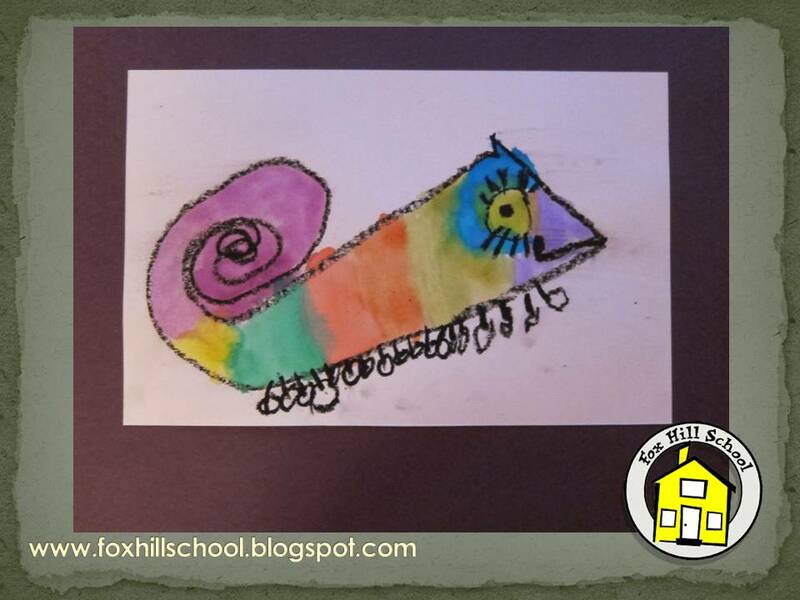 It is geared towards parents who have piles of their kids' artwork that they don't want to throw away but also don't want to have 1000 bins of art in their basement (like mine!) 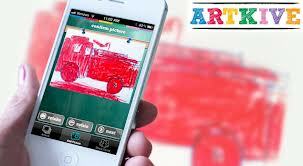 You can download this app, use your phone to take pictures of the art work and categorize the art chronologically. I made a file for each of my kids. Once you have saved the art, you can press a button and have it turned into a book! I haven't done that yet, but I'm excited to! Check out this commercial for Artkive - when I watched this I knew this app was for me! So this appeals to the "mom" side of me, but what I'm also thinking is that this would be a great way to document the kids' artwork at school and have it made into a book that they could enjoy in the classroom! Figures I found out about this once school was over! Maybe I'll make books about our 2 weeks of camp! Post a comment if you have used this app. I'm interested to hear how the books come out. 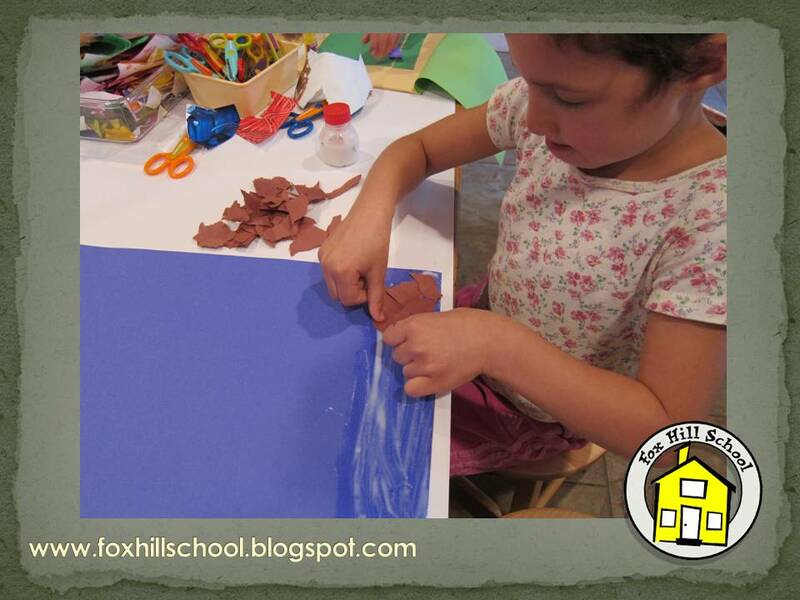 Each year at the Fox Hill School we have a few weeks of "camp" right after school ends. 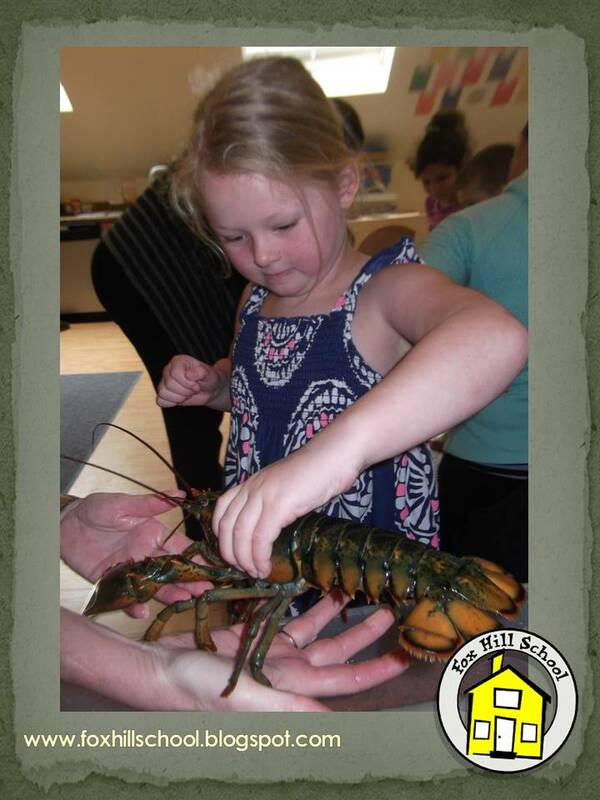 We use the proceeds from these camps for scholarships, teacher training, enrichment programs and donations to First Book. 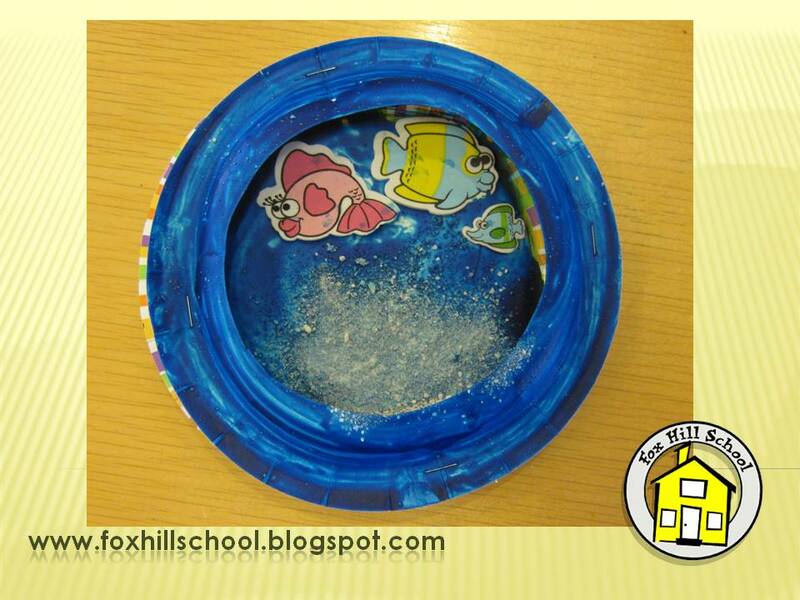 This week we had Under the Sea camp! 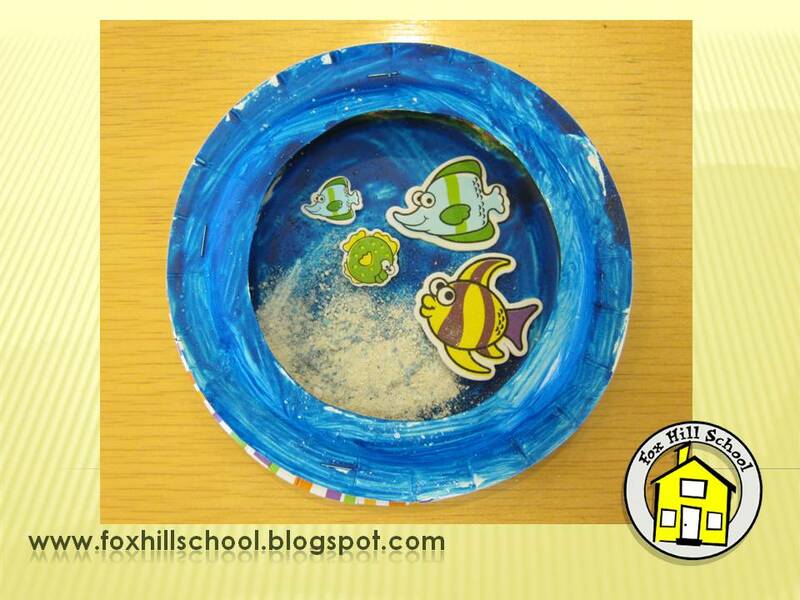 We made some crafts like these aquariums out of paper plates, paint, sand and fish stickers! 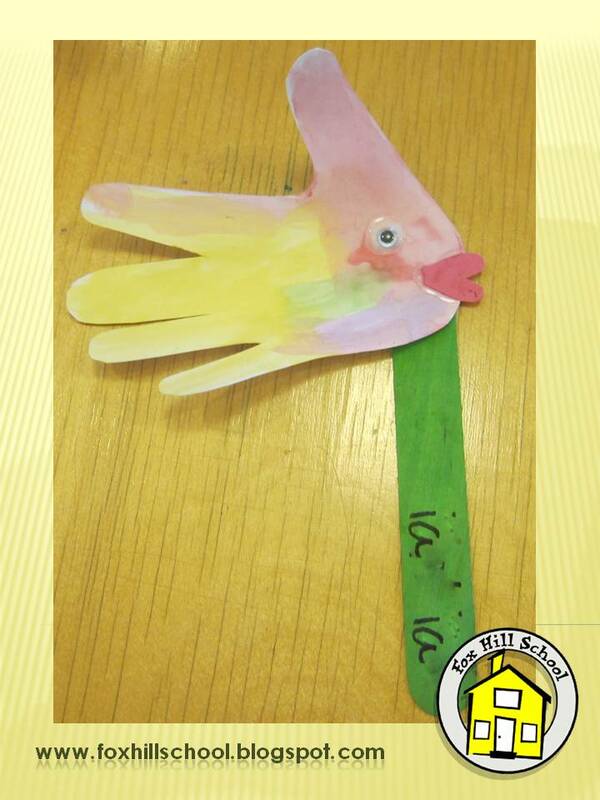 We also made "fish sticks" by tracing and cutting out our hands, using dobbers to paint them, add an eye and lips and glue them to a craft stick! 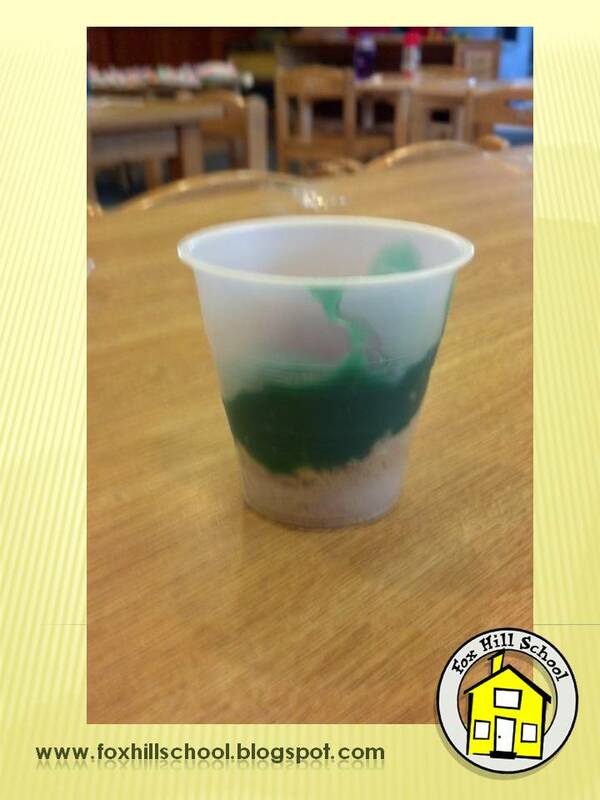 We attempted to make the "beach in a cup" for snack: first put crushed graham crackers in a cup as sand. 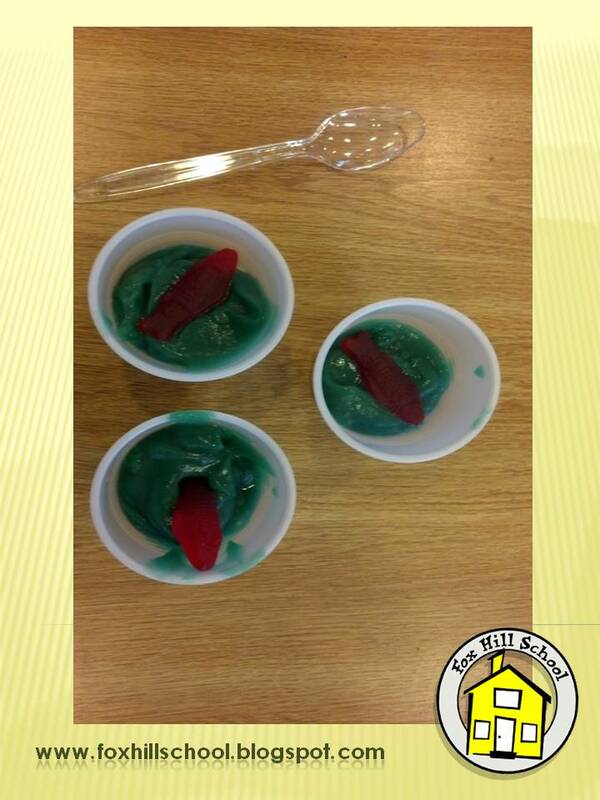 Add vanilla pudding with blue food coloring, and top off with one Swedish Fish! Although they tasted great and the kids loved them, BEWARE - vanilla pudding is actually yellow, not white, so when you add the blue food coloring the pudding turns more green than blue! We joked that it looked more like the water in "Boston Habah" (Boston Harbor) as they would say here in Massachusetts! 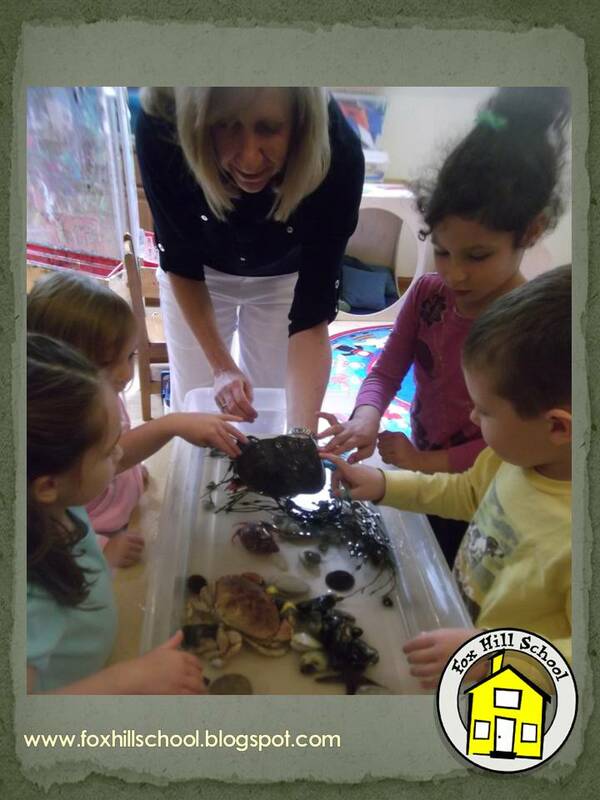 Then today we had a visit from Seatales, the traveling tide pool! It was awesome! If you are looking for a traveling tide pool to visit your school I highly recommend this program. The owner, Janice Petrie, starts the program by reading a book she wrote and illustrated herself called The Bumpy, Lumpy Horseshoe Crab. Then she introduces all the animals she has brought with her. All of the information she provides is in line with the Common Core Standards so it's educational AND super fun! Did you know that starfish drop their stomachs into a clam shell after they pry it open to eat the meat inside?! Who knew!?! After she explains which animals she has brought with her, all of the children are able to touch and pick up all the animals. and of course, a horseshoe crab! 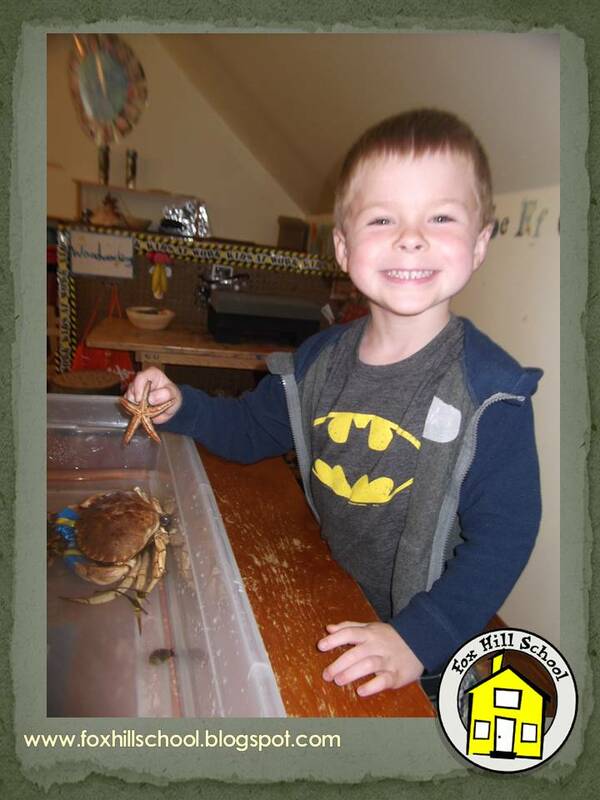 Check out her website for lots of information about tide pool animals! If you would like to purchase a copy of her book, click on the book below to purchase from Amazon! It's All About the Goody Bags! We like to recognize a job well done at the end of the school year so we make goody bags for the graduation celebration for each child to take home. We include things such as graduation bubbles, pencils, a book or two to read over the summer and a diploma. At the beginning of each year we measure each child with string and save it. Then we do the same at the end of the year and include both strings in the goody bag. It never ceases to amaze me how much the kids have grown right before our eyes! Every year the parents are just as amazed as we are! You could also include a CD with the pictures you've taken throughout the year, a yearbook or any other sentimental items the families might enjoy. 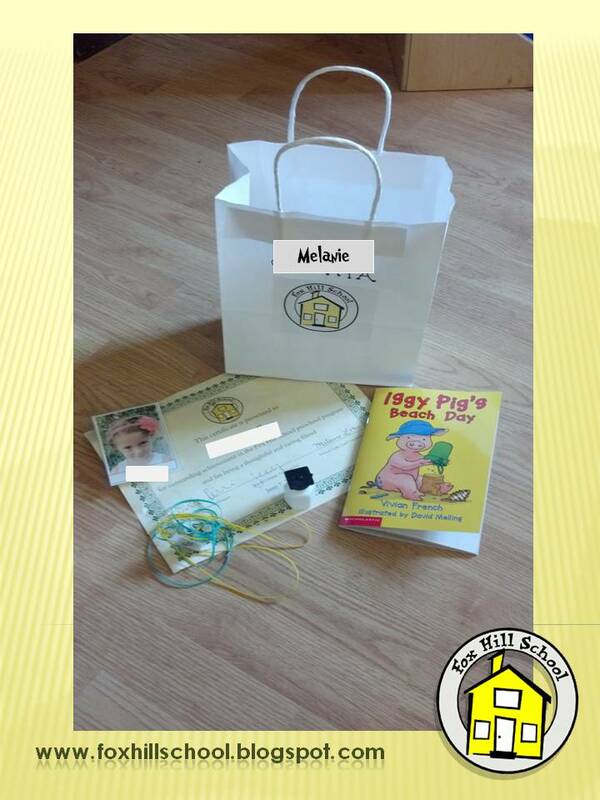 A little parting gift for the kids to enjoy and a few items for the baby book! 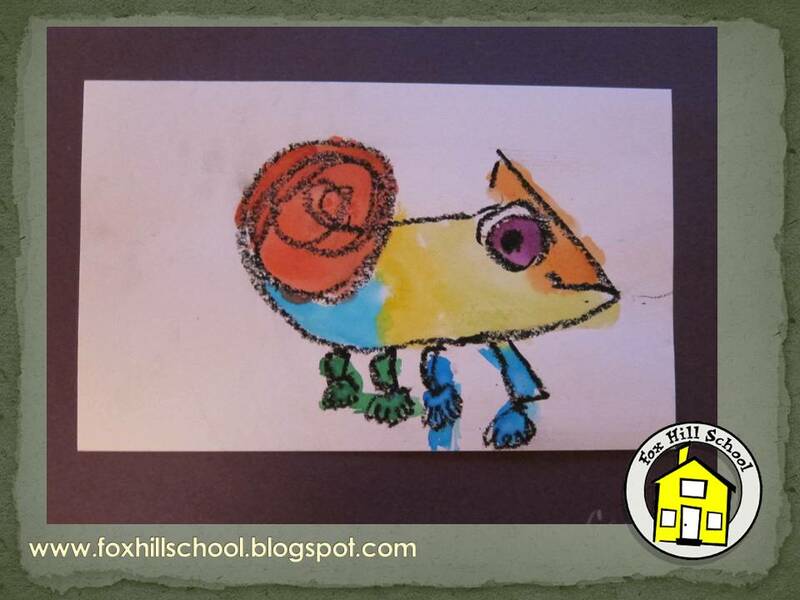 We've been operating the Fox Hill School for 11 years in a relatively small town in Massachusetts. It seems as though every time I leave my house I run into one of my "preschoolers" who is now in 8th grade! 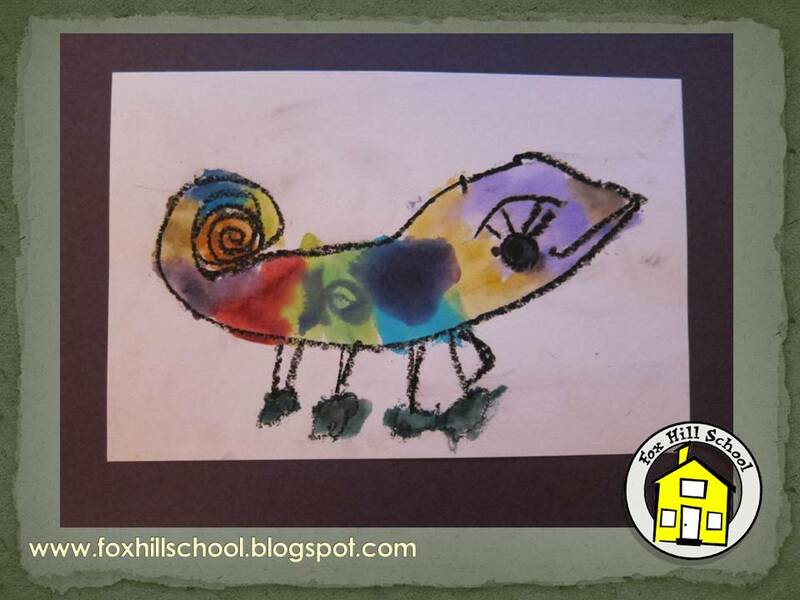 Although it makes me feel VERY old, it also makes me realize that we have had the honor of touching the lives of many, many children in the past 11 years and we have many, many alumni of the Fox Hill School! We feel we have a very special relationship with these friends who graduated from our program and moved on to become outstanding elementary, middle school and even high school students since they went out our door into the big world! 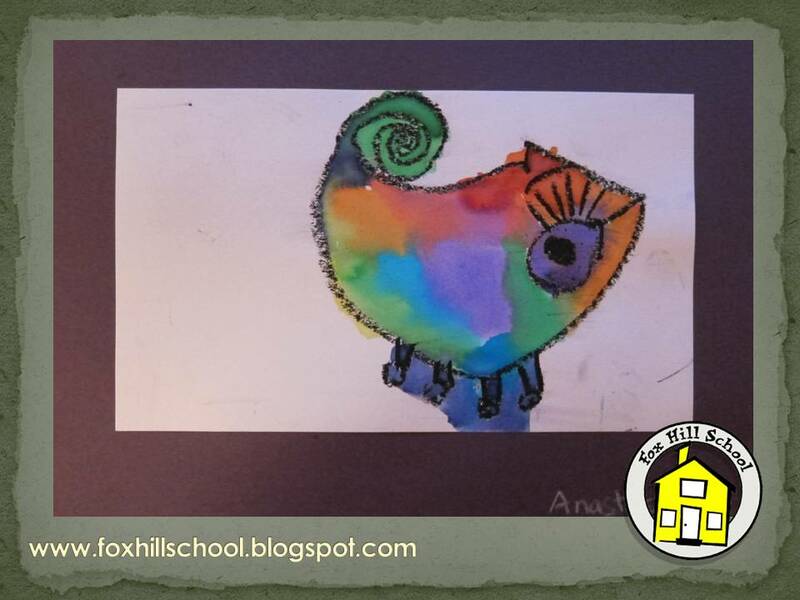 To acknowledge these special friends who come to to our graduation ceremony each year to see their younger siblings, cousins or friends graduate from the Fox Hill School we have created a special Fox Hill School Alumni logo (thanks to one of our awesome parents - thanks Rosemarie!) that we use to make T-shirts for the event. It made me teary at our graduation last Friday to look around the room and see dozens of FHS alumni enjoying the celebration! We are so lucky to be able to part of these kids' lives even after they leave us! 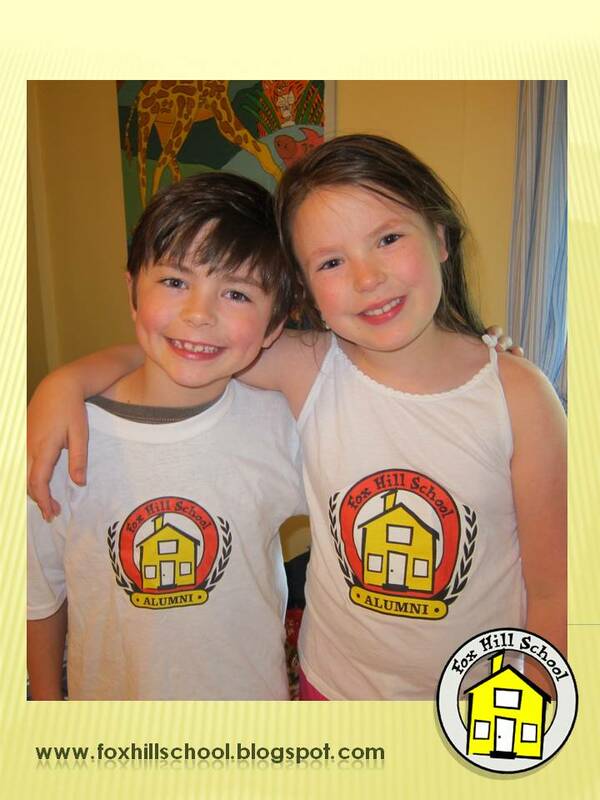 The T-shirts are a simple, inexpensive way to acknowledge our special friends and remind them that they will always be a part of the Fox Hill School family! Decorating for the Graduation Celebration! 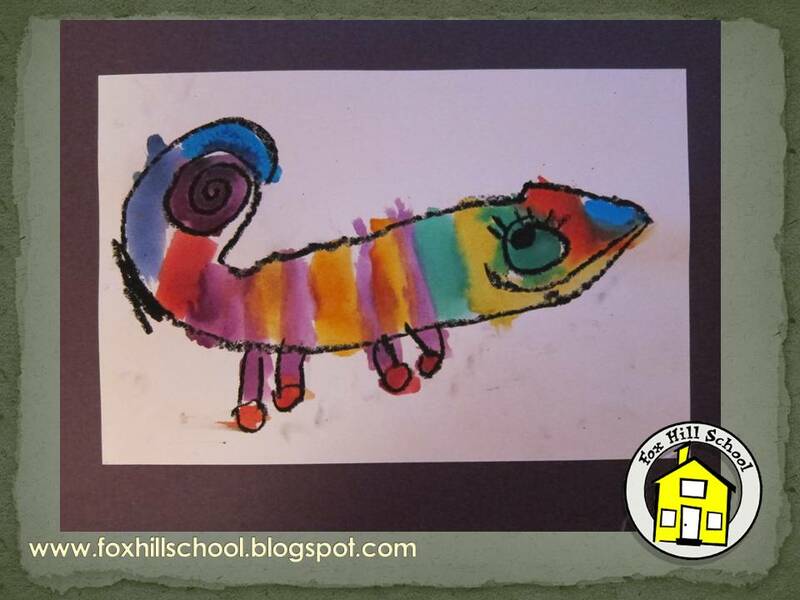 At the Fox Hill School we like to end each year with a big party to celebrate each child's accomplishments and wish them well in their Kindergarten adventure! We like to decorate the room with the children's work. 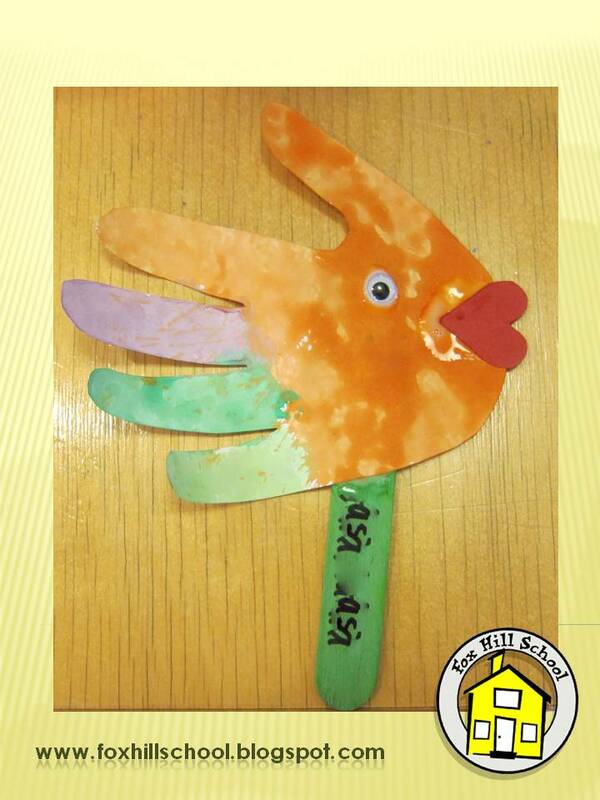 At the preschool we have each child make a self portrait. Then we take photographs of each child (this year Ms. Emily and Ms. Sarah took the photos, trying out what they learned in their photography class!). 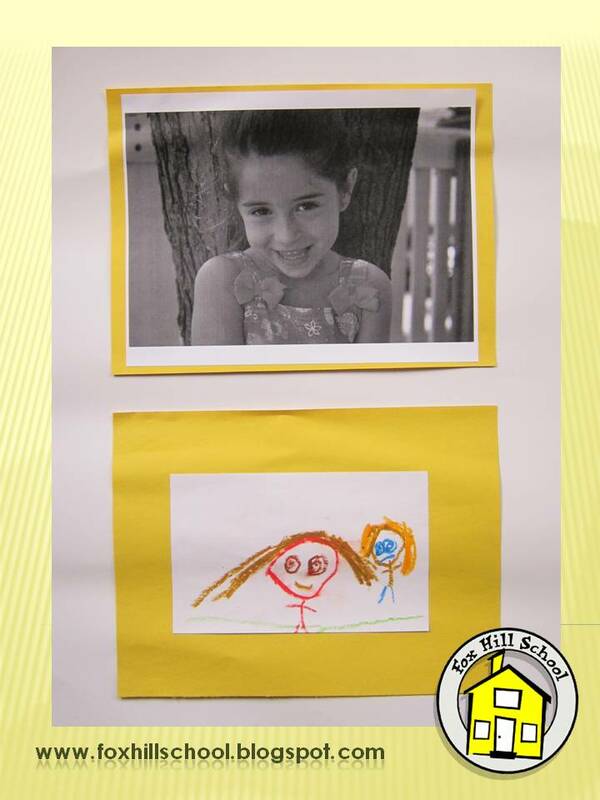 We mount the self portraits with the photos and use them to decorate the room. At the end of the celebration each child gets to take their display home. Each family gets a nice gift and the decorations clean up themselves! 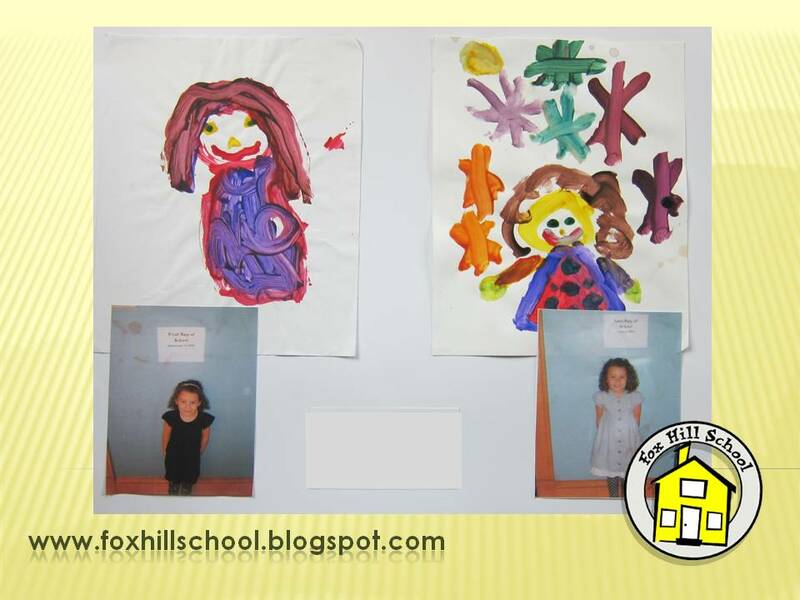 At the PreK/Kindergarten this year, we had the children paint a self portrait at the beginning of year and took a picture of each child on the first day of school. Then during the last week of school we had them paint another self portrait and on the last day of school we took their picture in the same place under a sign that was at the same height as the sign from the first day of school. We mounted all of these items on a poster board and used them to decorate the room. It was so amazing to see how much each child grew over the year. It truly looked like we started with babies and we gave back big kids! This was a huge hit with the kids and the parents (and the teachers!) Fun ways to celebrate a successful year! One of the lessons from my art class this spring with Deep Space Sparkle was this watercolor piece based on the book A Color of His Own by Leo Lioni. Last year I did a tracing project with this book but this directed line drawing was much more fun. 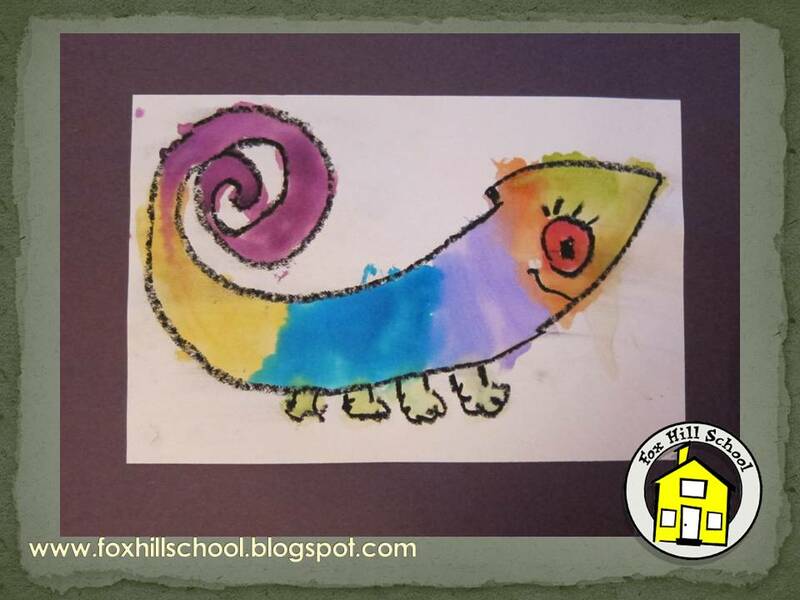 It was very easy for the PreK and Kinders to make the directed line drawing and they were so impressed with themselves at how great they turned out (in much less time than one class time) they wanted to make another! 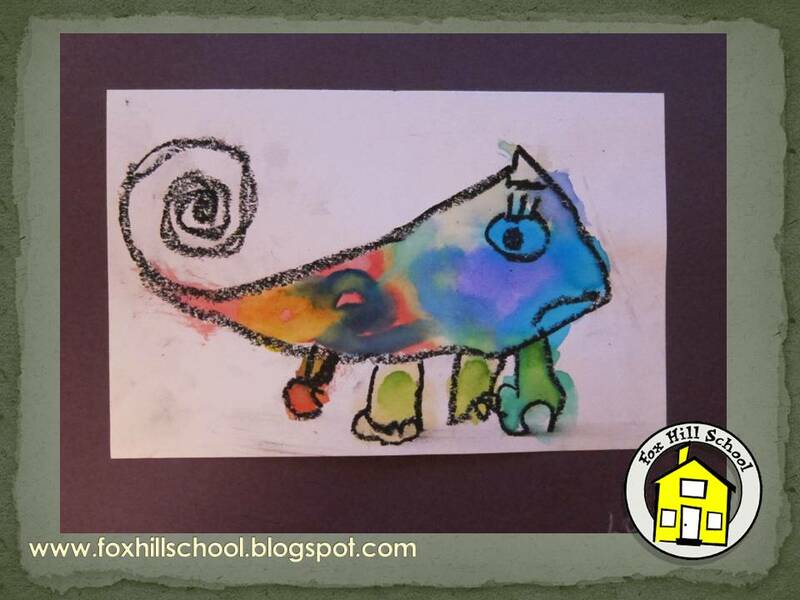 Check out some of the great chameleons with colors of their own! Buy a copy of A Color of His Own from Amazon by clicking on the book below! I can't believe this school year is coming to an end. 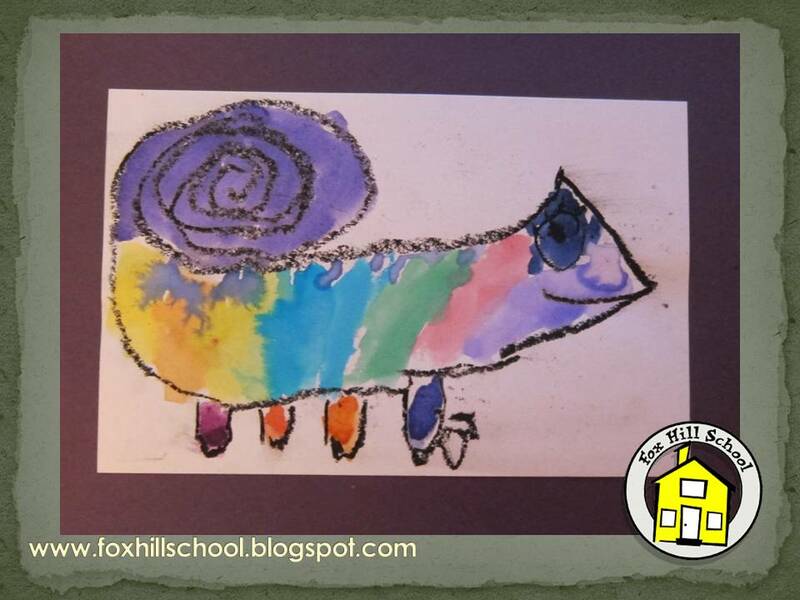 This is the last week of school for our Fox Hill School programs. We like to celebrate the end of a successful year and at our PreK/Kindergarten program we do that with a family field day. I saw a super cute idea on Pinterest recently that we did with our Kinders this year for our field day. Each child (and each teacher!) drew a self portrait. I had them use Sharpies so they would be dark (and of course they LOVE using Sharpies)! 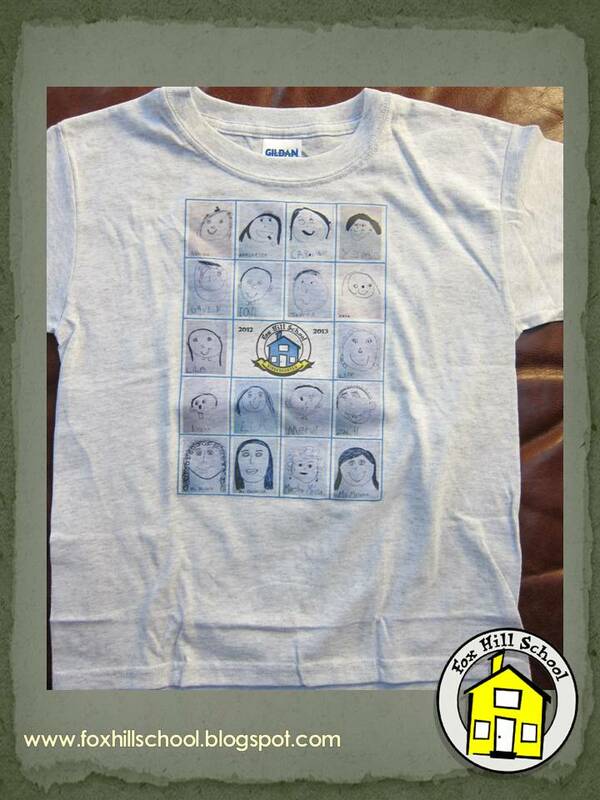 Then I scanned the self portraits and designed a T-shirt with all the kids' faces for them to wear to the field day. 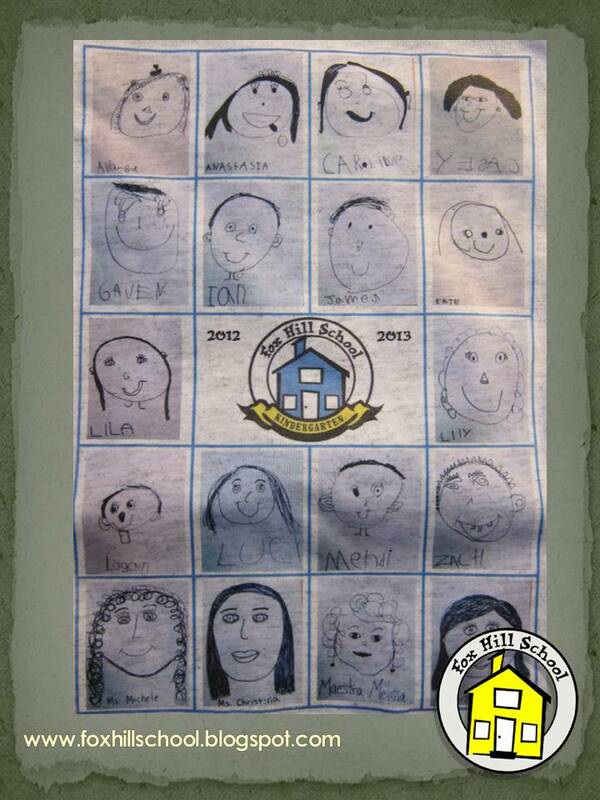 Now they will have a shirt with all their little school buddies on it. I think they came out really well! I can't wait to see what they think! 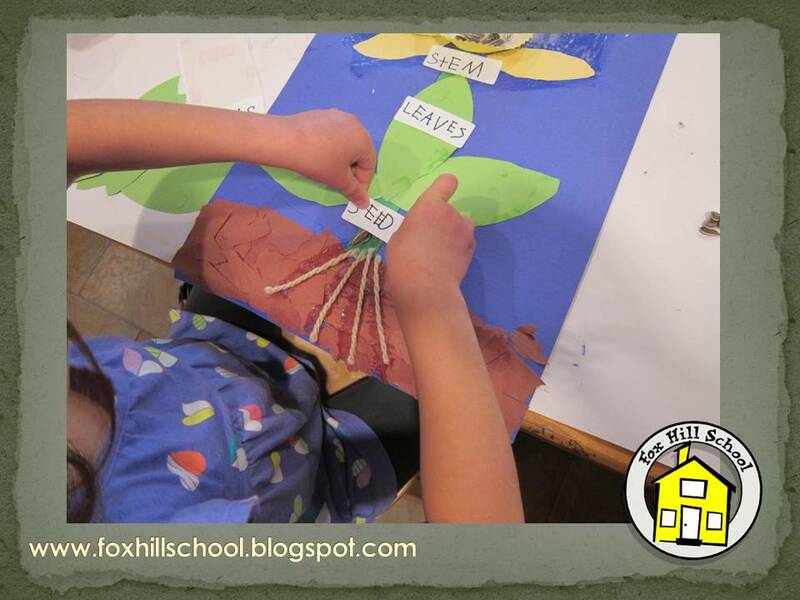 We have been learning about plants in our science class at the Fox Hill School Kindergarten. Since I am the art and science teacher I thought I would take this opportunity to combine the two learning experiences! 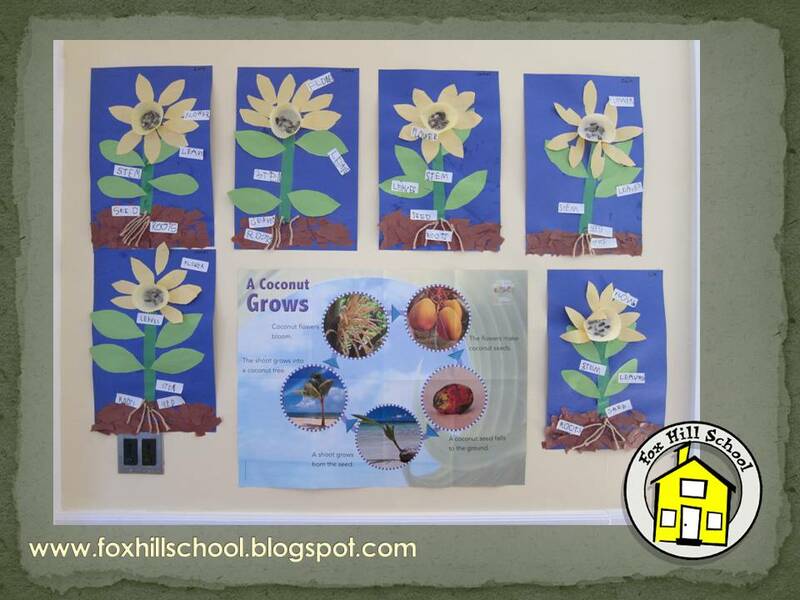 I like to have child created displays in as many of the areas of the classroom as possible. In this case we made sunflowers in art and then labeled them like scientists would so we could learn the different parts of the plant and have some cool art work to display in our science area. First we put our fine motor skills to work and tore brown construction paper to make the soil and glued it to the bottom of our papers. Then we added a construction paper stem, roots made out of yarn, and glued an actual seed to the bottom of the stem. 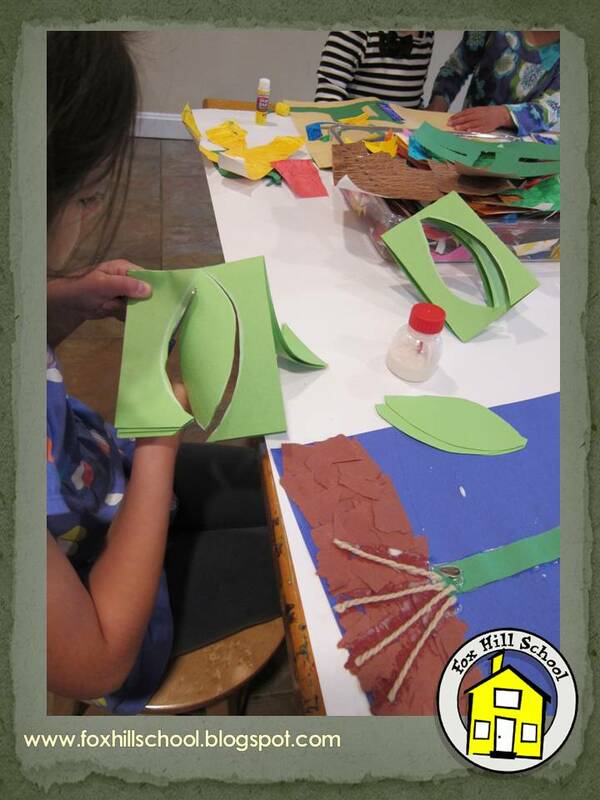 Then I folded green paper into fourths and had them cut out leaves and folded yellow paper that they cut out for the petals. This is a very time consuming project so I drew shapes on the folded paper for them to follow. 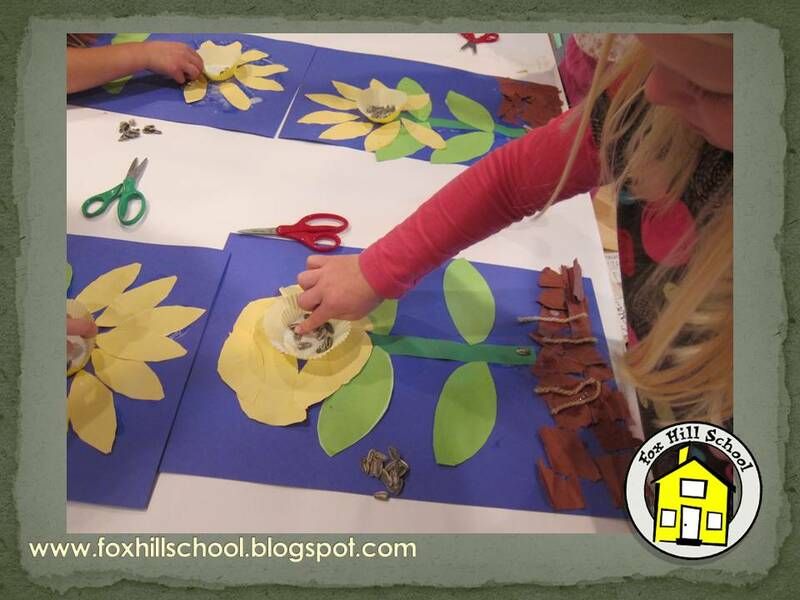 After their flowers were assembled, the kids glued real sunflower seeds into a cupcake paper and glued that into the middle of their flower at the top of the stem. Once the flowers were complete, it was time for labeling our creations. I gave each child five Avery mailing labels for them to write the parts of the plant on. Using the labels encouraged the kids to write small and also made it easy for them to peel and stick their labels onto their flowers. I will definitely use the labels again if they need to label something - it was much easier than writing on paper, cutting and gluing! Once all the flowers were dry, we displayed them in the science area among the other science posters. It's not always easy to have child made displays in the science area and this one looks great! 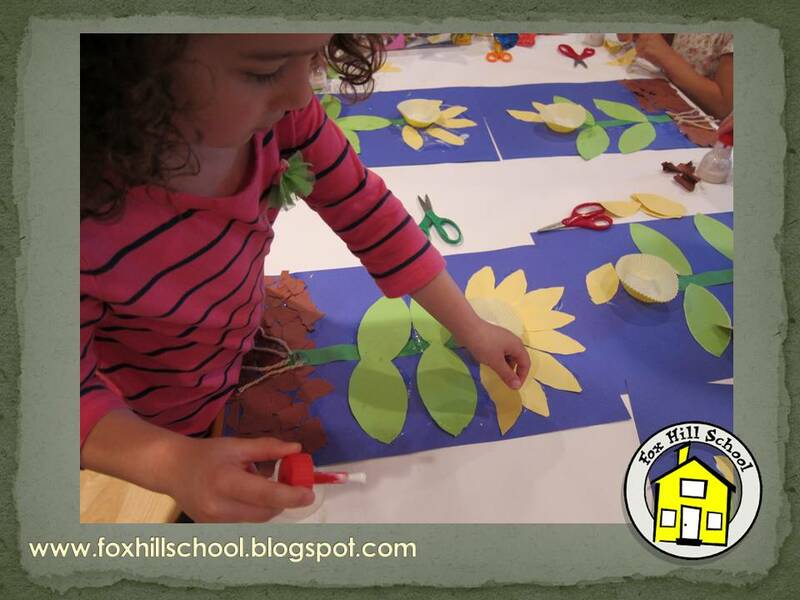 The kids often find their poster and practice the names of the parts of the flower. Science and art as one- mission accomplished! Click on the books below to purchase some of the books we used with this unit from Amazon!